Are Gas Tankless Water Heaters Worth It in Cold Climates like Denver? Yes, gas tankless water heaters can work well, even in cold climates, as long as the unit has been sized correctly to meet the hot water needs of your particular household. What is my household’s hot water demand and is it too high for a tankless water heater? We’ll explain what “hot water demand” is, why it’s so important and how you can determine your family’s hot water demand. What is “hot water demand” and why’s it so important? Your “hot water demand” refers to the maximum amount of gallons of hot water you need at any one time. Knowing your hot water demand is important because tankless units are limited by how much hot water they can produce in a given time. So how much hot water is “too much” for a tankless water heater? Well, according to Energy.gov, tankless water heaters typically produce hot water at a rate of 2 to 5 GPM (gallons per minute). So if your household consistently needs more than 5 gallons of hot water at any one time, you may want to ask a professional if a tankless unit is the best option for you. For example, let’s say that on regular mornings you run the dishwasher (2 GPM) while two people shower (4 GPM). Given that you’ve surpassed 5 GPM (you’re now at 6 GPM), your tankless unit would most likely have trouble keeping up. Meaning it will start sending lukewarm (or even cold) water to your fixtures. Need an idea of what your household hot water demand is? It’s pretty easy to determine. Just follow the instructions below. 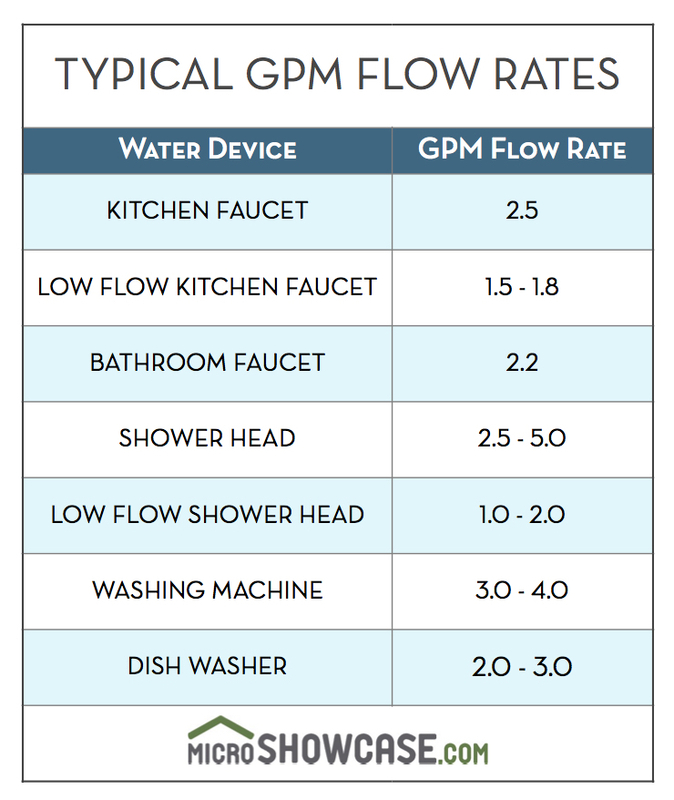 Use the chart below to add up the GPMs of all the hot water appliances you might use at a given time. If your total GPM exceeds 5 GPM, talk with a professional plumber to see if a tankless water heater would work well for you. Have a high hot water demand but still interested in a tankless unit? A professional plumber can determine if there is a gas-fired tankless unit that can accommodate your high hot water demand. Tankless water heaters must be sized according to your hot water demand, the temperature of your incoming cold water, and the temperature at which you prefer your hot water. Having a professional size your water heater prevents you from getting a unit that is too small and can’t keep up or a unit that is too big and causes your energy bills to skyrocket. A point-of-use unit (POU) is a tankless water heater dedicated to a specific hot water appliance (like your shower) instead of providing hot water for the entire home. Since the POU unit is dedicated, that means multiple appliances are not competing for hot water. And, therefore, the unit is more likely to provide endless hot water consistently. Also, POU water heaters save energy because they're closer to their dedicated appliance, meaning that water loses less heat while traveling to the appliance. Need advice that’s specific to your home and your family’s hot water needs? Just contact us. We’re happy to perform a home evaluation and give you the professional water heating advice you need. Why Does My Shower Drain Smell Bad?